Organic foods are becoming more available in a growing consumer market. Organic production implies growing in a pure and chemical free environment. However, organically grown includes those products that are “fresh” and/or “locally grown”. Today, organic foods may be found in the grocery stores, health food stores, farm stands or CSA’s. Recognition of the benefits of eating healthier is gaining momentum in the choices made by consumers looking for a better lifestyle. Organic growing requires planning and diligence. Before the first crop is ever planted, much thought must be put into the types of crops to be grown, soil preparation and the greenhouse environment. The greenhouse is best utilized to protect the plants from exterior weather conditions and grow crops in a “resourceful way”. Being resourceful with greenhouses is important with both warm season and cool season crops, crop rotation, low operating costs and high yields. RGS Greenhouse Systems, we work with customers to develop a greenhouse plan to address your need from a simple greenhouse or “high tunnel” to a more comprehensive greenhouse plan utilizing the latest technologies. One of the most recent innovations from RGS Greenhouse Systems is the development of a moveable greenhouse – “Rolling Thunder™”. Rolling Thunder™’s design utilizes a heavy duty wheel with bearings at each set of hoops attached to a specially designed “ground post”. 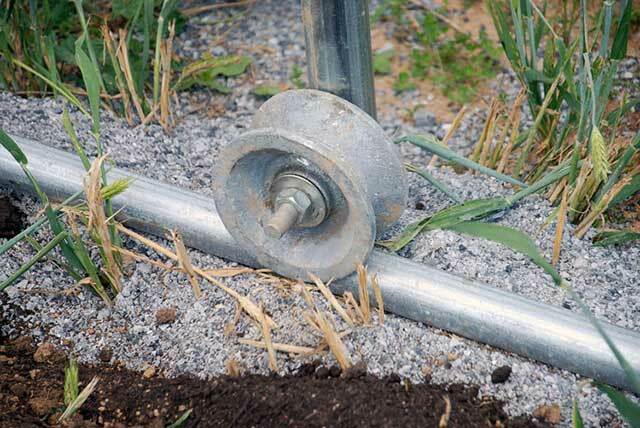 The wheel/ground post combination is seated on a rail which allows the greenhouse to move along the desired growing areas. Rolling Thunder™’s design allows for easy movement of a larger greenhouse such a 30 x 96 with just an ordinary tractor. Smaller greenhouses can be moved by just two individuals. 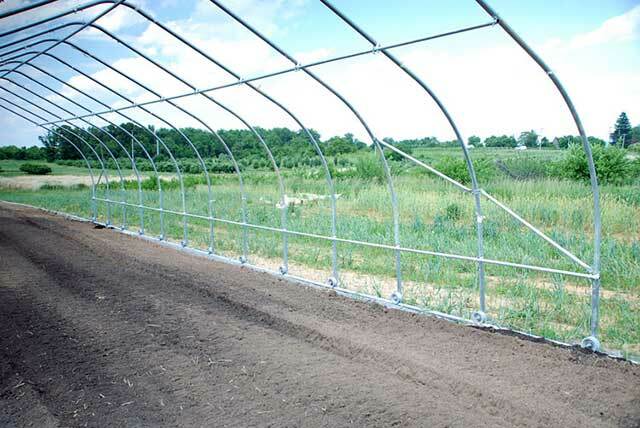 The Rolling Thunder is constructed fairly simply with the rail laid out flat according to the desired width of the greenhouse. The rail does not have to be pinned or staked, but should be set on solid base of stone dust to prevent sinking into the soil. The first few hoops are the trickiest requiring several sets of hands due to the fact that the wheels, ground posts and hoops are all erected simultaneously. However, once a few hoops are erected, the rest of the greenhouse goes up quickly. 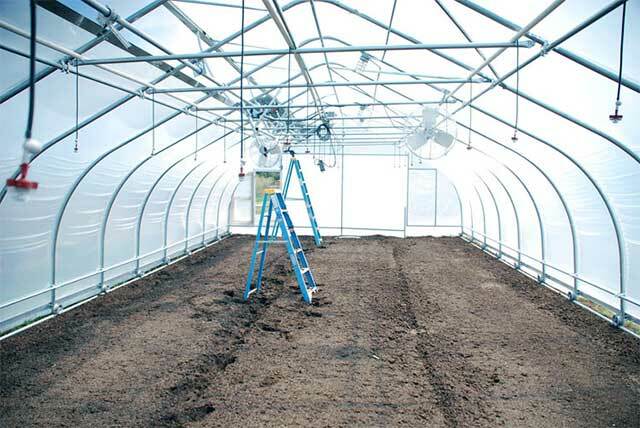 There is significant bracing in the greenhouse to prevent any movement with the wind, and temporary bracing is used on the end walls of the greenhouse for stability purposes. Use baseboards or double wire lock for along sides of greenhouse at bottom of bows. The base package includes the frame work complete with all pre-drilled steel, hardware and instructions. Each base package includes 2" x 4" end wall framing brackets, a single layer of 6 mil, 4-year UV treated poly for the roof and end walls, poly lock for the roof and end walls, and a pair of roll up side wall kits with double wire lock. 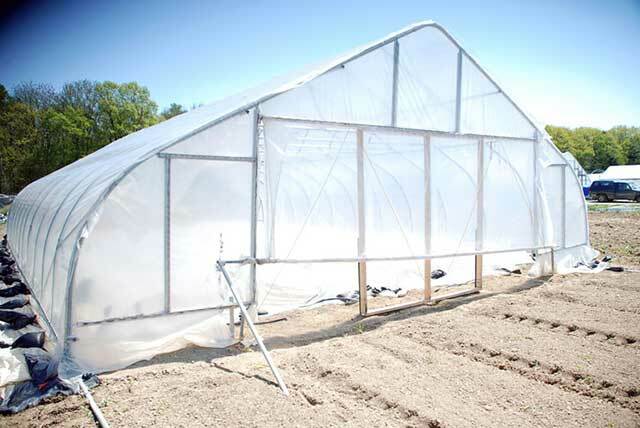 All of the extra hardware, wheels and components are included to roll the greenhouse over two plots (i.e. ; 48 ft. long greenhouse has 96 ft. of pipe and components).